The Fossil Q Explorist is a Wear smartwatch that brings the metal. 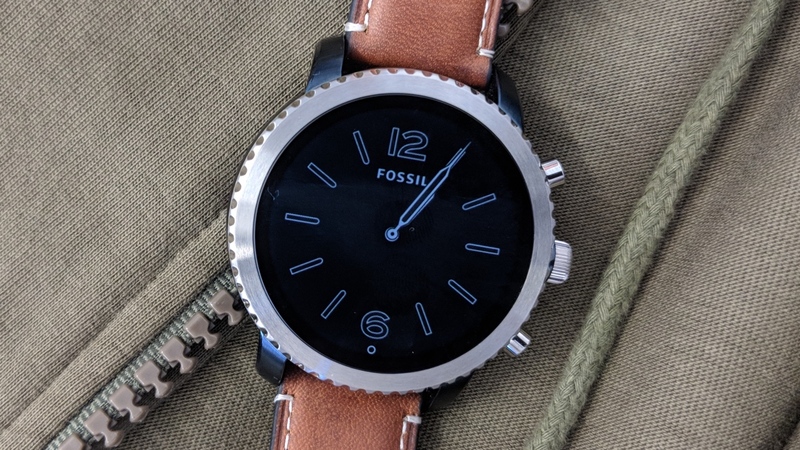 It's essentially the successor to the Fossil Q Founder, a first generation Fossil smartwatch we actually really liked and would have liked it more had its touchscreen not been packing one of those horrible black tyres. Fossil's third generation watch is available in a collection of very men-friendly looks and comes packing Wear 2.0. That means it'll play nice with iPhones and Android phones, bringing you features like notifications, activity tracking, music playback control and access to Google Assistant. Priced at $255 if you opt for the model with a leather band, or $275 if you want the all-metal look, the Explorist is quite reasonably priced and significantly cheaper to own than an Apple Watch. For that money, you won't be getting a Wear watch will all the bells and whistles, but more of a compromise on those connected smarts while retaining the good looks of a 'dumb' watch. With so many smartwatches from Fossil and its sub-brands, like Skagen, Diesel and Emporio Armani, this is one company that's making sure you have plenty of options to choose from. The question is, should the Explorist be the one you spend your money on? We've been living with the third-gen Fossil smartwatch to find out. Read on for our verdict on the Fossil Q Explorist. At its core, the Q Explorist is a round, 46mm watch with a stainless steel casing, with the option of a bit of metal or going full metal jacket. The model we got to live with was the Luggage Leather edition, which features a matte blue metal casing, a lovely industrial-style stainless steel bezel and a gorgeous 22mm leather watch strap. In case you couldn't already tell, we really liked wearing this smartwatch. It's arguably one of the nicest Wear smartwatches we've put on our wrist, and, for our money, it's up there with the Skagen Falster and the Michael Kors Access in terms of replicating the feeling of wearing a normal watch. At 12mm thick, it's still not quite as slender as we'd like a smartwatch to be, which is odd considering it doesn't have any sensors like GPS, a heart rate monitor or NFC to house. But the extra thickness isn't something we really noticed. This is not a watch that weighs heavy on the wrist, though that may be a slightly different proposition with the all-metal model, so that's worth keeping in mind. Its 46mm frame suggests it's one for those with daintier wrists to avoid, but we didn't feel like it sat too bulky on our skinnier wrists. It's every bit a watch designed for men and has the versatility to be worn with informal or more formal attire. But while it does have an IP67 certified water resistant design, we're not sure you'd really want to go for a swim with it. The element that does tell you this is a smartwatch is, of course, the touchscreen. There's a 1.4-inch, 454 x 454 pixel resolution AMOLED display that is thankfully fully round. There's no flat tyre here, my friends. There is a slim black screen bezel around the edge of the display, but it's not that noticeable, especially when you opt for a darker watch face. It's sharp, bright, vibrant, offers good visibility in most conditions and is up there with the best screens you can find on a smartwatch. That display is flanked by a crown and two buttons above and below it. The crown can be pressed to launch the app drawer or held down to launch Google Assistant. It also twists, giving you an alternative way to scroll through the Wear interface. The button above gives you quick access to Fossil's own software add-ons (more on that later) with the one below getting you to the Google Play Store to download some apps. That's just how they are set as default, but you can program them to be assigned to other features as well. You'll also find that Fossil makes room for a mic to offer voice control support and make use of Google's own smart assistant. The Explorist looks the part, feels like a well-built watch and, unlike some of Fossil's other Wear watches, has something unique to offer in the design department. Hopefully all Fossil watches will follow in the footsteps of this metal watch number. Before we get into what you can expect from Wear OS on this smartwatch, let's deal with those specs first. It's pretty standard fare here, with a Qualcomm Snapdragon Wear 2100 processor and 512MB of RAM powering performance. There's also 4GB of storage with Bluetooth and Wi-Fi support on board. What you get is a pretty zippy performance swiping through screens, launching apps and generally interacting with the Wear UI. It will, of course, work with iPhones and Android phones, as we mentioned earlier, and while Google is seeking to offer a more equal experience when paired with either phone platform, Wear still feels a better, more complete fit with Android handsets. Hopefully this will change soon, though, as this was a big part of Google's decision to rebrand Android Wear to Wear OS. On the sensor front, you're getting an accelerometer and gyroscope motion sensors to offer fitness tracking support through Google Fit, and third party Wear apps with no serious sports tracking features on board. That's hardly surprising and not that big of an issue when you consider that this isn't a smartwatch built for run or gym lovers. It's all about the style. It's also reflected in some of the few extras that Fossil adds to the Wear setup. That top physical button gives you access to the same My Styles feature as found on the Fossil Q Venture. You also get the same couple of games pre-installed that are nice time killers, if not at any threat of replacing a game you'd reach for on your smartphone when you're bored. Those handful of customisable watch faces are still in place, too, with the Digital option a nice fit on the Explorist. Aside from that, this is Wear at its most basic, where aspects like notifications and music playback support impress the most but it still lacks that intuitiveness you get from rival smartwatch operating systems. There is Google Assistant on board, as we say, but it still feels a little clunky on smartwatches. What's more disappointing is that it misses out on Google Pay, which would have been a great fit for the Explorist – as it would be on all the other Fossil smartwatches that lack the ability to make payments from the wrist. As is the case with all of Fossil's third generation Wear smartwatches, the Explorist is going to give you an estimated 24-hour battery life. When you compare that to what Fitbit and even Apple's smartwatches (maybe less so) offer, it's definitely not the best you can get from a smartwatch. You'll comfortably get a day out of it and it may even stretch to half a day extra on top of that when you put the battery saver mode into action. But two days is definitely out of the question based on our experience. If you're prepared to accept that you'll be charging it as regularly as your smartphone, then great. If not, well, there are better options out there for you. One positive is that's nice and easy to charge because Fossil uses a very Apple-eque style wireless charging disc, which magnetically clips to the back of the watch and should get you up from 0-100% in a couple of hours. It's definitely one to do when you're asleep. The Fossil Explorist is one of the best looking Wear watches for men, and while it doesn't escape from some of the gripes we have about Fossil's other current smartwatches, it's a bit easier to forgive when it does such a fine job of hiding away those smarts. The smartwatch features are basic and it's a shame that payment support isn't there, but if you're looking for well-priced alternative to the Skagen Falster or the Michael Kors Access Grayson, this is the Wear watch to go for. i notice you didn't mention if it has a speaker, also are you able to receive & answer phone calls?? ?